So, I am looking through the dessert section and I wanted to settle on something simple. There are about …. 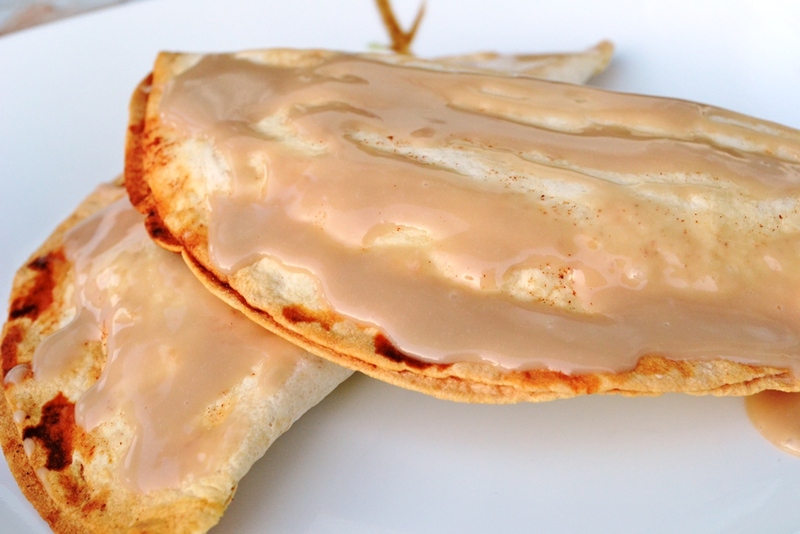 recipes and I finally decided on the Apple Cinnamon Tortilla Pockets. It’s pretty much mid-September thus apples are starting to be available everywhere. Since I picked up some nice juicy ones from the Farmers Market I thought this recipe would be perfect. Jessica starts with a nice introduction, giving a little background on tortillas, what you might want to look out for when buying at the store, how to heat them and some special instructions for later in the book. The cook book itself is segmented into Breakfasts; Starters and Snacks; Soups, Salads, and Sides; Wraps and ‘Ritos; Meat Main Courses; Meatless Mains, Tux-Worthy Tortillas; Comforting Casseroles; Fun with Tortillas; and Sweet Endings. There is also an Appendix in which she explains how to make your own tortillas, certainly something worth trying. Each recipe starts with a little introduction by the author. I really liked that because it tells you why this recipe is there and how it is connected to Jessica. The instructions are easy to follow and described step by step. One thing I am not so happy about was that there are no pictures except on the cover. This is small cook book but I think some pictures, even in black and white would be nice so that the reader would get a feel for some of the dishes. However, I find the cook book a definite asset to my kitchen. It will help me to decide what to do with those tortillas that I buy once in a while. So far I usually just made regular wraps with them so this will switch it up. The recipe is not a word for word copy from the book. The instructions are largely in my wording as well as the tips. 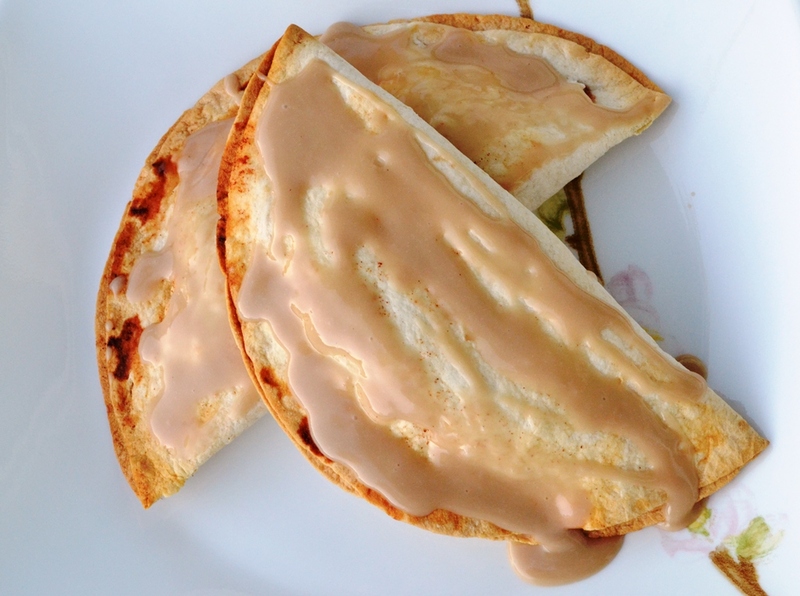 Excerpted from Tortillas to the Rescue by Jessica Harlan. Copyright © 2012 by Ulysses Press. Reprinted with permission from the publisher Ulysses Press. Tip 1: I am not sure what “good baking apples” are. I just used the ones from the farmers market and I am not even sure what they were called. The tortillas were store bought but if you are so nifty and make your own, I am sure it works as well. Core and peel the apples, then slice into thin strips. You probably could grate the apple as well just make sure the pieces are not too big so that it will cook nicely. Add the lemon juice, sugar, corn starch and cinnamon and toss well. 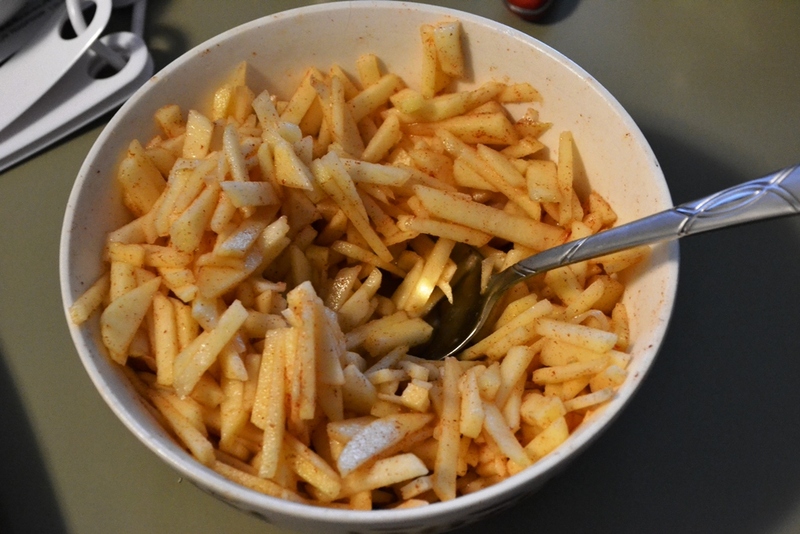 Set aside for a moment so that it can produce juice and the apples are able to take in the cinnamon. 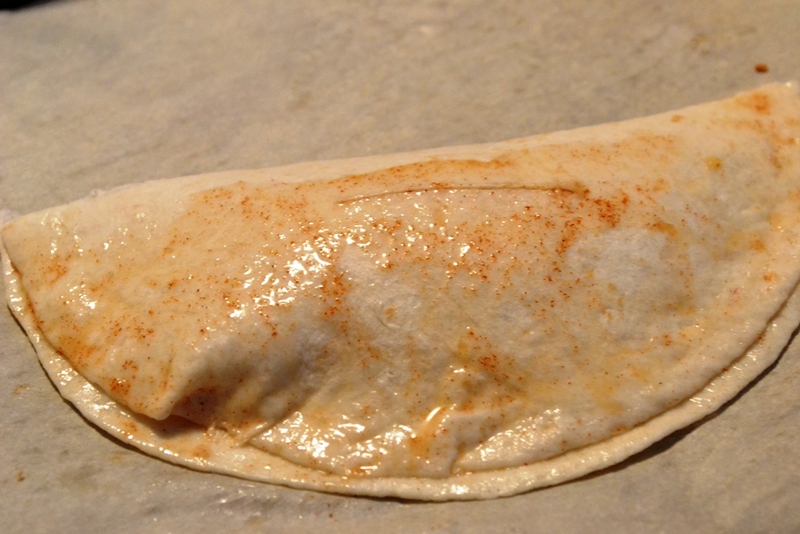 Take a tortilla and lay flat on a baking sheet lined with parchment paper. Then add a nice amount of the apple mix onto one half of the tortilla. Wet the edge of the tortilla, about 1 inch, with water and fold the tortilla over. This will form the pocket. Make sure to press the edges together, which might take a moment. Make one or two small slices on the top so that steam can escape and the pocket doesn’t explode. Bake at 180°C for 25 min until the edges are slightly brown and crisp. Remove from the oven and let them cool out somewhat. Mix some icing sugar, vanilla and milk together to make a icing for the pockets. Drizzle over the pockets and let it dry for a bit. 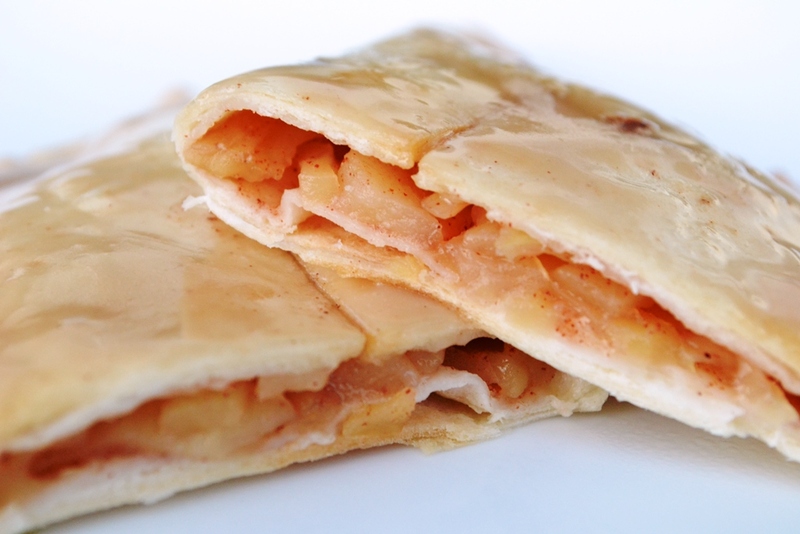 Apple pockets are most delicious when slightly warm. 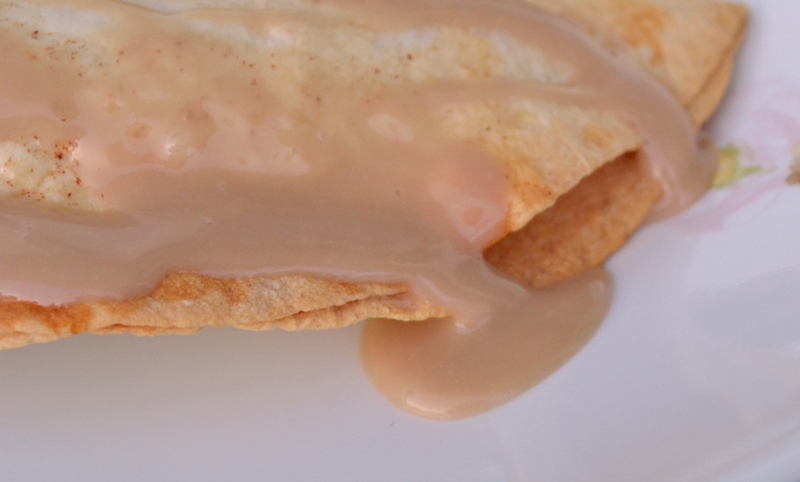 Tip 2: This is a simple and easy dessert which takes little time. You can also send them as snack to school. Add some chopped nuts or raisins for extra flavour. Disclaimer: I received the book for free from Ulysses Press, however, the opinion in this post are solemnly mine and I have not been paid for this. Hi! I just found your blog when I was searching for some information about the new quiche restaurant on twentieth. I perused a little – nice! Always good to find a local blogger – we have the same ingredients at the same time! I’m not affiliated with either of these web pages, but have you ever perused foodgawker or tastespotting? (I won’t link, just in case you’re worried about viruses). They provide a wider audience for bloggers by providing a single site that bloggers can submit their photos. Some of your pictures are certainly worthy. I’ll be checking back to see what you bake next. Happy blogging!